For Christmas I got some washi tape that I will use in my bullet journal. 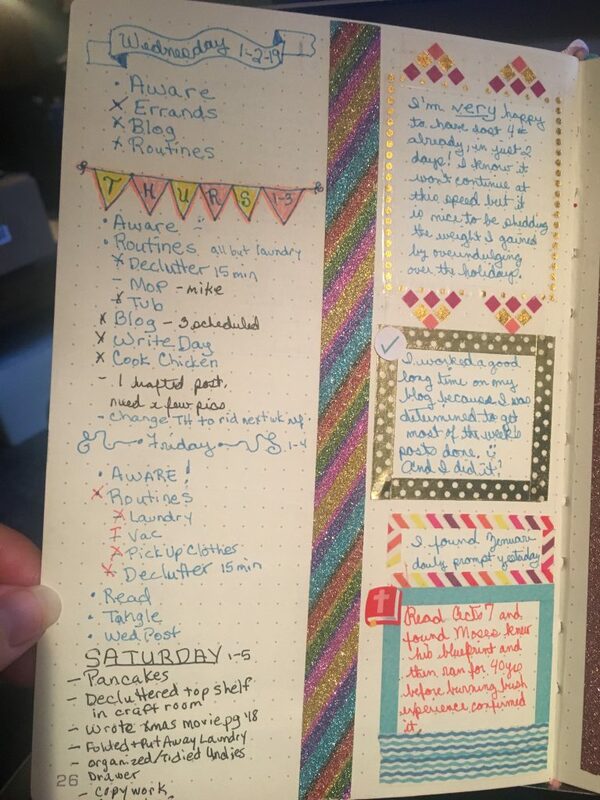 You see, I like to use my bullet journal minimalistically using only colored pens as I make my to do’s for any given day. I do leave space in between the two columns I create to run a strip of washi tape in between them. 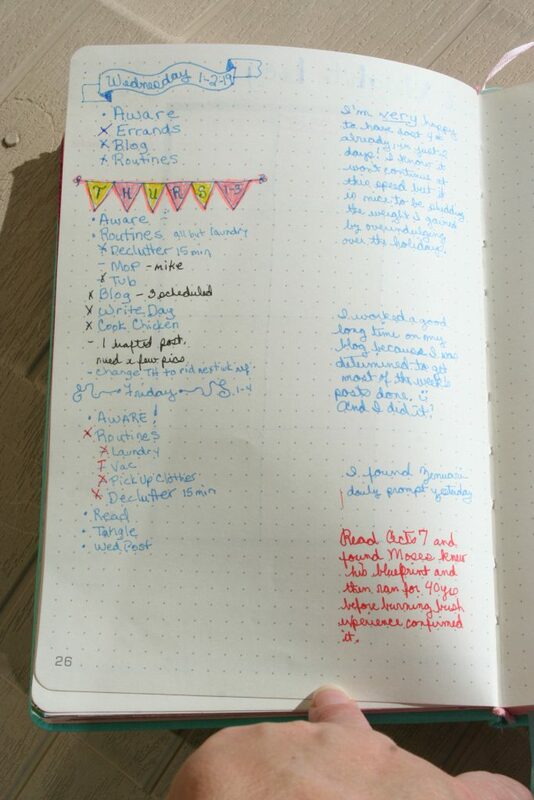 This livens up my pages, making them prettier. As you can see I add in my thoughts as they come about; if it takes a lot of space I may start a new page or use a large section. I just let it flow and don’t stress out about it. This is to make me more productive and a place to put my thoughts instead of sticky notes and notepads left all around, thus I know that whatever note I’m looking for is in this journal somewhere. Here’s the same page after I prettied it up. That is much more appealing to me. I like to do art, as you can tell by my Wednesday posts but I don’t like the pressure of putting my art in my bujo (bullet journal). This particular page is a bit more varied than what I usually do but it’s okay for me and that’s who it’s for. 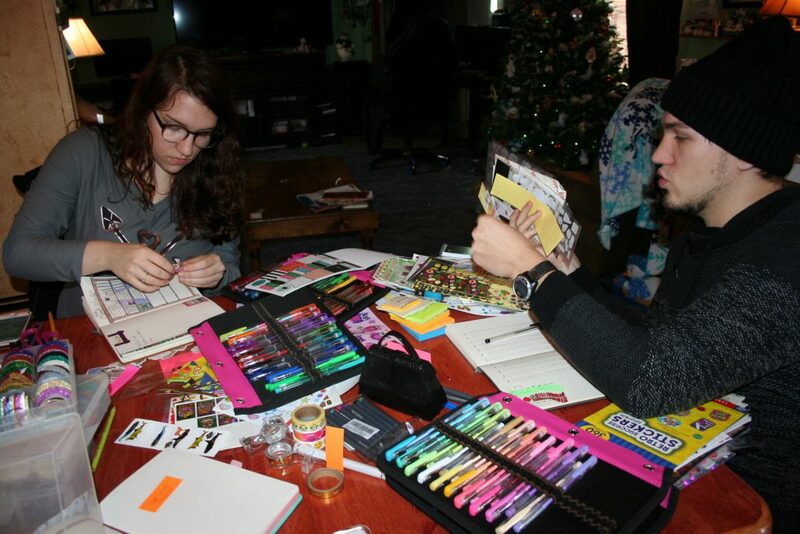 So, now that you know how I use my washi tape, I want to share some of what I got for Christmas. I got glitter rolls last year for my birthday and really wanted some foil ones but also found I needed to have some plain colored rolls too. 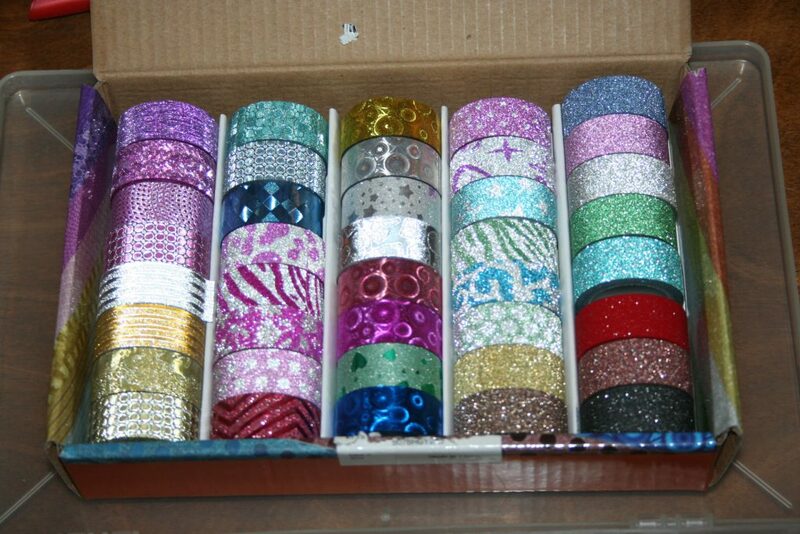 However, as I looked for those I found so many wonderful floral and foil accent rolls, as well as even more glittery rolls. Here’s a close-up of some of them. One of the things I like about these glittery ones is that they are not rough to the touch and don’t lose their glitter everywhere. They also tear with a straight edge instead of needing to be cut with scissors. As I was looking at things to put on my Christmas wish list, I realized I probably needed a bin to put the washi tape in. 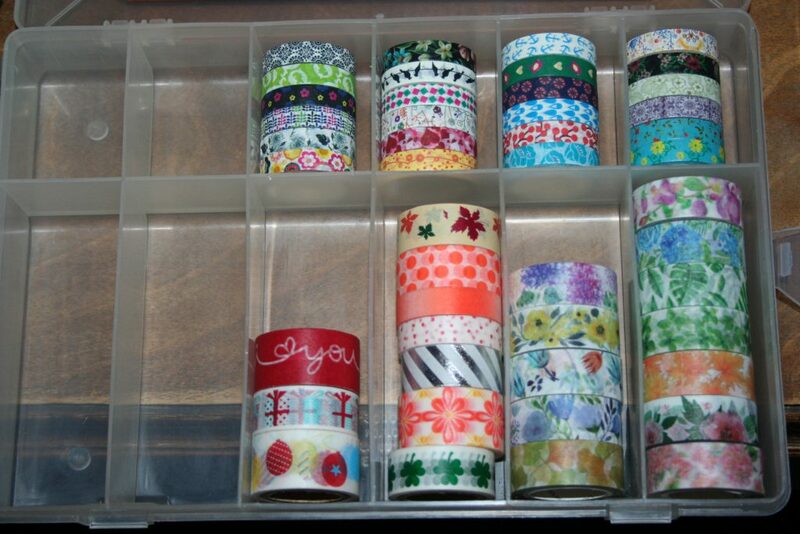 The one I found is a nice deep one that holds any of the rolls I own (1st washi tape bin above). But, I filled it up way too quickly. However, I remembered that I had a similar organizer holding plastic fusible beads from years and years ago. Since they haven’t been used in ages, I decided they could be stored in a baggie and I could re-purpose the container for some of my washi tape. They aren’t as deep as my new one, but most of my rolls have a smaller diameter and fit nicely (second washi tape container above). Between Christmas and New Year’s Day I worked on getting some collection pages done that I knew I wanted to have ready to use. Tiffany also uses a bullet journal and loves to pretty hers up as well. Sean got a bullet journal for Christmas this year; he’s had the habit of making huge lists on sticky pads but now he has somewhere to put the lists that are easy to refer to. Since he’s started farming this year, it will be a great way to keep track of what he’s doing. 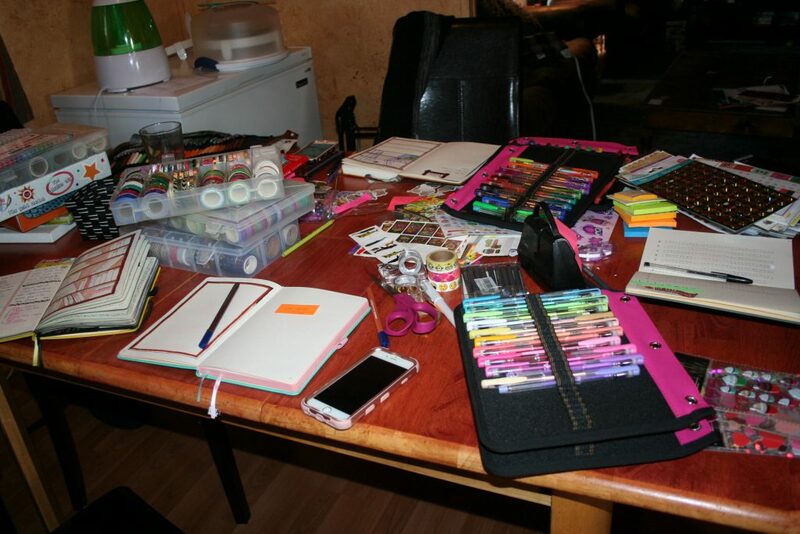 So I shared my supplies of washi tape, stickers, pens, markers, and such with them. 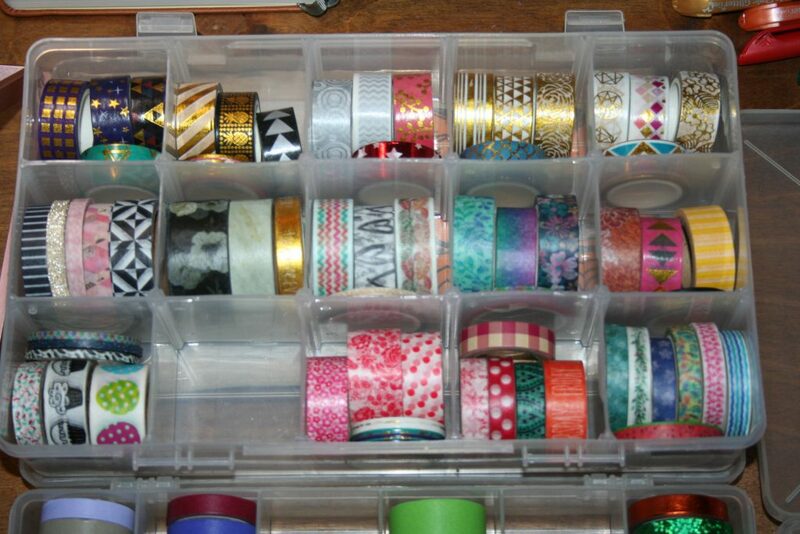 After Christmas was over and I added the rolls of washi tape I got from extended family and the rolls I’d gotten several months ago, I filled these bins and another one I found hanging out in my craft/storage room. 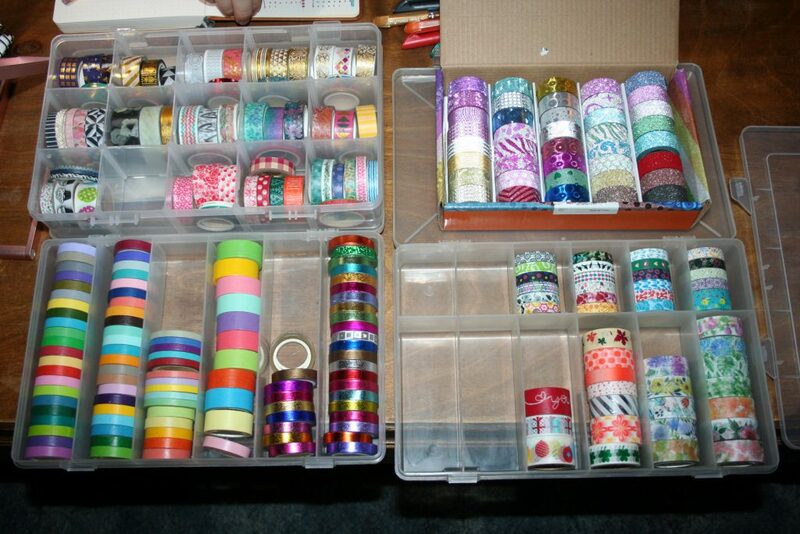 Even though it doesn’t seem possible that I could need any more washi tape, I’m sure that come my birthday I will have found more that I want. I decided I wanted to go over and visit my mom to see how she is doing since coming home from her knee replacement surgery. It worked out that my sister Sondra, who has come to help Mom and Dad, needed to go run some errands, so she felt better about leaving while I was there. Especially since it turned out, Dad had his first physical therapy session that day as well. (You might remember that he had open heart surgery after Thanksgiving.) He wasn’t even home by the time I needed to head home, so I look forward to seeing how that went. However, while I was there a home health nurse came by to check up on mom and how she’s doing, so we didn’t have much time to visit. She is doing well but says there is MUCH pain and it is hard and tiring work getting the knee broken in (my words, not hers). I’m very proud of her though. She is really doing everything they tell her to do, despite the pain. It’s sad because pain is the reason she decided to do this in the first place. We are trusting that by the time spring gets here, she’ll have the worst behind her and be glad she did it. Well, I’ve rambled enough for today. I hope you have a good weekend. It’s supposed to be horrendously cold here this weekend. I sure hope we get some snow. Everyone else is getting snow and I want some too. (I think the Christians in Tulsa hear the weather forecast for snow and pray against it and thus we don’t end up with much. ) I’d like to get snow now because my peach tree needs warmer temps come March and April. A good friend of mine had knee surgery and about a year out she’s pain-free and has her mobility back. She’s so glad she made that choice. Yes, there’s a fair amount of pain at first, but it’s not the pre-surgery pain of a knee that is deteriorating. It’s the pain of surgery and healing. It fades over time and it’s way worth the mobility you get out of it. Praying for a quick recovery for both your mom and dad. Thank you so much Lori! What a great report of your friend and her surgery! Just the kind of thing that is encouraging to hear. Thanks for sharing.